Two events this week celebrate the release of the latest book from the South Dakota State Historical Society. Gary Clayton Anderson, author of “Gabriel Renville: From the Dakota War to the Creation of the Sisseton-Wahpeton Reservation, 1825–1892,” will be a featured speaker at the South Dakota Festival of Books, Sept. 20-23, in Brookings. Anderson will also speak at the Sisseton Wahpeton Oyate Tribal Headquarters, in Agency Village near Sisseton on Sunday, Sept. 23, from 2-3:30pm. In the end, whether scouting under Gen. Henry Sibley or serving as head chief of his people, Renville remained committed to traditional Dakota ethics even as he embraced the change he and others believed was needed to survive in the coming 20th century. Anderson is the George Lynn Cross Research Professor of History at the University of Oklahoma at Norman. He specializes in the history of American Indians of the Great Plains and American Southwest and has written numerous articles and books on the subject. “Gabriel Renville” is available as a hardcover book for $29.95, plus shipping and tax. 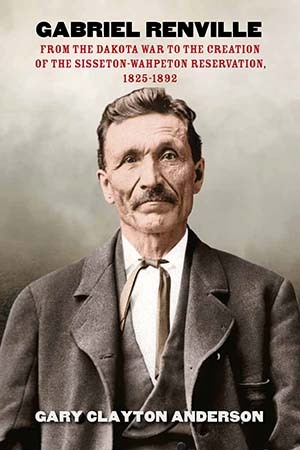 It can be ordered directly from the South Dakota Historical Society Press at sdhspress.com or by calling 605-773-6009. Follow the South Dakota Historical Society Press on Facebook (SDHS Press) and Twitter (@sdhspress) for more.